We are a family owned local business providing professional tree removal and tree management services for Brisbane and Springwood. When you work with us you are getting fully qualified and insured professionally trained arborists who are passionate about caring for the environment. We are committed to providing excellent service at a price that’s affordable and where possible we’ll give you alternative options for tree removal. We can help you out if you have a rental property or your own property with trees that are causing you problems and are not protected under local council laws. We are highly experienced at removing trees that are diseased, dying, dangerous, and damaging to property. We also do land clearing where trees are blocking a development site. 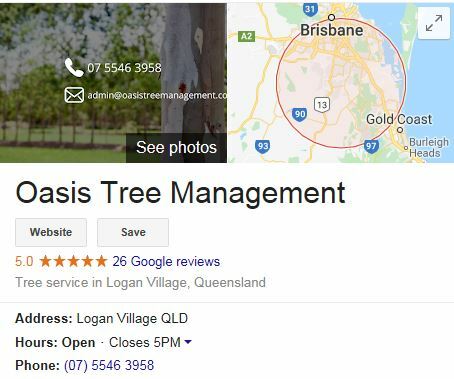 If you have a protected tree that requires removing, Oasis Tree Management can assist you in obtaining council approval with our complimentary Council Liaison Service. Our team can let you know if a tree is protected by the local Springwood council and where relevant we can help with the necessary paperwork and an Arborist Report if required. Our tree pruning service is a great way to tidy up your yard from overgrown trees and shrubbery. Pruning requires someone with experience and the right equipment and methods. If tree pruning is not done correctly, tree pruning can leave trees fragile and potentially even dangerous. Professional pruning can prevent trees from becoming unmanageable but it also has the advantage of opening up your garden allowing it to flourish. Unfortunately, many tree loppers in Brisbane are inexperienced which often means you can end up paying more in the long run to fix a job that was not done correctly in the first place. If tree lopping is not done correctly it can damage the tree and even make it a potential hazard for falling. Our expert tree loppers will ensure the structure of your tree stays in its natural form and that the job will be done right the first time. When we’ve finished our work, we’ll clear up any fallen branches, leaves, twigs, and seeds and leave the job site tidy. Along with trees we also care about the animals that inhabit them. If we spot a koala, a bird nest, or a possum nest in a tree we won’t resume work until the nest, animal or animals have been safely relocated.